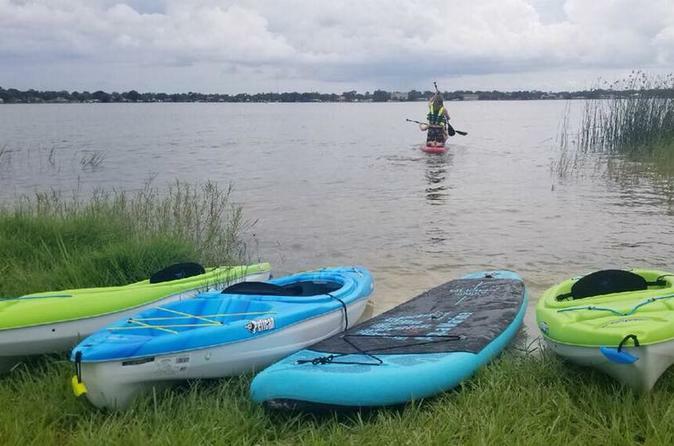 We are Orlando's newest kayak and paddle board center located next to Grill's Lakeside on beautiful Lake Fairview. We are geared towards wholesome family fun and if that is what you are looking for then this is the place for you. When you arrive you will be greeted by our local friendly staff who will help you get ready for your time on the water. After you are fitted for a life vest and given all safety equipment you will be able to launch from our private beach. While on the water make sure to take your time, relax and experience the beauty of Lake Fairview. There are two other lakes you will be able to travel to if you wish, float by natural preserves or just take in the Florida sun. After your trip on the water, make sure to stop in at Grill's Lakeside to enjoy some locally inspired food. All reservations are per person and include SUP, paddle, life vest, whistle and safety instruction. Not valid with discounts. When you arrive at Grill's Lakeside, please check in at the red trailer next to the water. After you check in, you will be fit for a life vest and paddle and will walk to our private beach launch where you will receive all necessary safety information. You will then be able to use your allotted time on the lake as you see fit but we suggest to make sure to check out one of the connecting lakes as well. Once you arrive back, just leave all your equipment at the beach and we will take care of the rest. Before you depart, we recommend grabbing some local food at Grill's Lakeside.